In the past you might have expected the government to hit back in anger or self-defence if heavily criticised on its immigration policy. But ministers' responses to a report by a committee of peers have been surprisingly conciliatory, running along the lines of "there's a lot of common ground here" and "we're acting on almost all the committee's recommendations". The House of Lords Economic Affairs Committee found that immigration over the last ten years has had little or no positive impact on the living standards of the existing population. Cheap imported labour has benefitted employers and the migrants themselves, but not the wider population. In future, the Lords say, there should be a cap on migrant numbers. 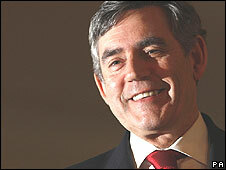 Gordon Brown did not exactly roll over and plead guilty at his monthly press conference - but he did answer their call to toughen up the system by saying that in most respects he was already doing so. First and foremost in the reform plan is a new points-based system for non EU migrants, so that only people with the necessary skills will be able to come here. But there will also be what he called a citizens' fund, into which new migrants will pay a higher contribution towards the services they use. And there will be higher fines for employers who take on illegal immigrants. But the peers' report was about legal not illegal immigration - there are by definition no figures on the numbers of people who shouldn't be here. And the government room for manoeuvre is limited by the fact that around half of all new migrants to Britain are from the EU (48% in 2006). Apart from Romanians and Bulgarians, EU nationals have an unrestricted right to work in the UK. The Lords committee wants the government to tighten up on the other non-EU half by imposing a cap on the numbers allowed in. That is something the Conservatives have been calling for - but the government has rejected it as unworkable, because it would not allow for flexibility should the economy suddenly require an influx of, say, scientists. The limits of the points-based system may have been shown in a final question to Gordon Brown from a Bangladeshi journalist, who asked about Indian curry houses facing a shortage of chefs because of immigration laws. Many restaurants, it is said, could face closure. Although curry chefs could be said to possess skills not found here, many may not speak English, and so would fail the language tests now being imposed. Mr Brown answered by saying the government planned to train people in this country to fill those jobs. Expect the nation's favourite chicken tikka masala to evolve somewhat in the next few years.